What does it mean to have giants like Google, Apple and Amazon investing in robotics? Since last December, Google alone has acquired a handful of companies in robotics, home automation and artificial intelligence. This can be pretty exciting for robotics. But what exactly is the internet giant planning to do with this technology? Is there something we should be worried about? If there is, what can we do about it? Experts have been actively talking about this in the media, including through Robohub’s recent focus series on Big Deals in Robotics. Last Friday, my podcast interview with Avner Levin was published on Robots Podcast. Avner Levin, a privacy and cybercrime expert, spoke about Google’s recent acquisition of companies. Levin sheds light on why we should be concerned about the recent series of acquisitions by the big companies from privacy and cybercrime perspective. He also discusses whether the existing privacy policies are ready to handle what may lie shortly ahead of us in the future — the future of the Internet of Things, or perhaps Google-branded robots. 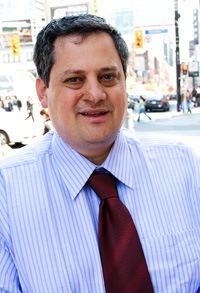 Avner Levin is the Chair of the Law & Business Department, as well as the Director of the Privacy and Cyber Crime Institute at Ryerson University in Toronto, Canada. His research interest is in regulation and protection of privacy with respect to technology within Canada and worldwide. In the interview, he advocates for more discussion of privacy issues to take place, not just within the companies that (do/will) hold our data, but by governing bodies. Previous What does it mean to have giants like Google, Apple and Amazon investing in robotics?